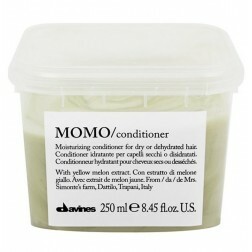 Davines MOMO Anti-frizz Protective Fluid with moisturizing and protective action enhances the smooth effect. MOMO Anti-frizz eliminates the frizzy look, facilitates shaping of the hair and enhances the smooth effect as well as counteracts the destabilizing action of humidity. Protects your hair from the damaging effects of pollution. 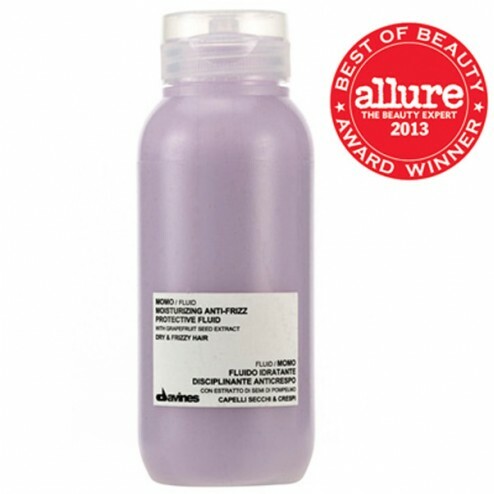 Results: Davines Anti-frizz Protective Fluid minimizes the frizzy effect and facilitates shaping of the hair, keeping it smooth and soft for a long time. Protective action against pollution and aging, long-lasting smoothing effect. Use: After shampoo and conditioner apply the right amount of product on wet hair beginning at the tips. Define shape with the hairdryer and, if you wish, use the ceramic plate over the hair. View Full Davines MoMO Collection. WaterAqua/Eau , Dimethicone , Propylene Glycol , Octyldodecyl Ricinoleate , Cyclopentasiloxane , Disiloxane , Citrus Grandis (Grapefruit) Seed ExtractGrapefruit , Panthenol , Rhizobian Gum , Sambucus Nigra (Elderberry) Flower Extract , Simmondsia Chinensis (Jojoba) Seed OilJojoba , Creatine , Dimethiconol , Polyquaternium 28 , Lauryl Alcohol , Polyacrylamidomethylpropane Sulfonic Acid , Triethanolamine , Dicaprylyl Ether , Trideceth 6 , Hydrogenated Polydecene , Ethylhexyl Methoxycinnamate , Sodium Polyacrylate , Mica , Titanium Dioxide , Acrylates/C10 30 Alkyl Acrylate Crosspolymer , Cyclohexasiloxane , Phenoxyethanol , Methylparaben , Ethylparaben , Propylparaben , Isobutylparaben , Butylparaben , Disodium EDTA , Citric Acid , Potassium Sorbate , Blue 1 Lake (CI 42090)CI 42090 , Red 33 (CI 17200)CI 17200 , Parfum/Fragrance.